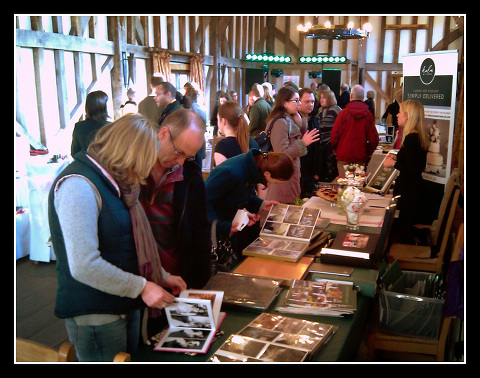 On Sunday we were at the Gate Street Barn Open Day (see previous post). 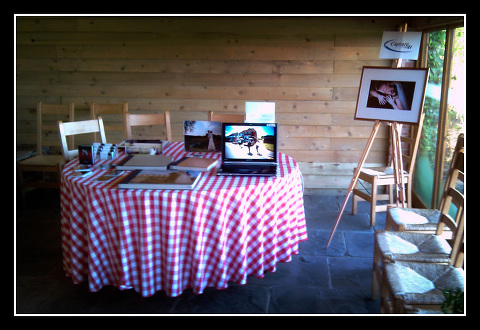 It was fabulous day, the weather was stunning, the Barn looked gorgeous and we got to meet lots of new people. Jane, Lisa & Hillary did a fabulous job and we were so impressed with the organisation, attention to detail and friendliness of all there. The day was very busy and so if you didn’t get to speak to us directly then please give us a call as we’d love to chat about your wedding plans. We met so many couples planning their special day, some just finalising details for their wedding this year and others just starting their search. 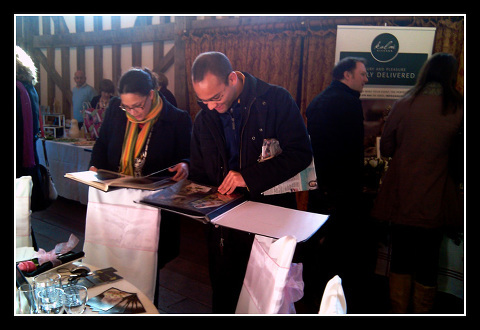 The Open Day was great as it showcased many different suppliers who could help with all aspects of the day. It was also great to meet up with some old friends: Jen & James at Kalm Kitchen (Caterers), Carole at Tandem (Caterers), Chris from Chess (DJ), Gill Pike (Florist), Nick & Claire Stow (Cars), Rupert at Taurus Wines (Independent Wine Merchants) and Antonia from Elle Au Naturel (Make-up and Hair Artist). It was lovely to catch up on their news and see the new products. Kalm Kitchen had their fantastically gorgeous chocolate brownies on offer, you will never taste a better brownie! Gill Pike had some lovely new flower table decorations which looked stunning and Nick and Claire Stow from Cars for all Occasions had photographs from the Colin Firth new movie which was filmed in London and featured their car. Imagine travelling to you wedding in the very car that Mr Darcy has sat in!! 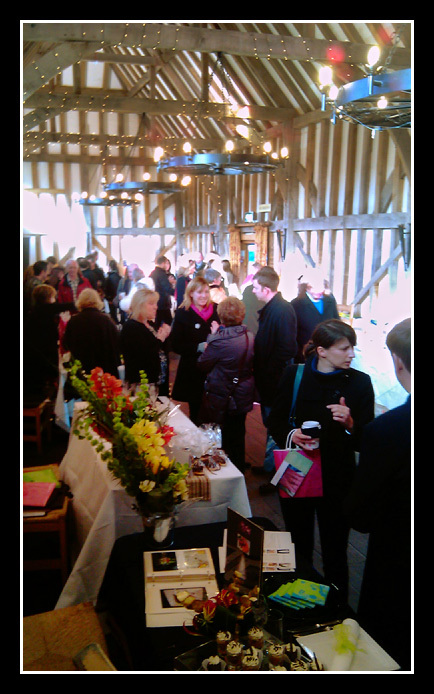 We also got to meet new people, Rollercoaster (Band), Cranleigh Cupcakes, Talisman Chauffeur Cars, Rae Oakley (Hats), Simon Alexander (Magician) and David from Talisman Chauffeur Cars. We’ve put links to all their websites below. Cranleigh Cupcakes are a tremendous find, their cakes are stunning with such attention to detail and variety of designs. They can even make bespoke Bride and Groom cake toppers with little touches that show off your personality. All their sales support breast cancer charities as this was the motivating factor behind the start of the company. They are an exceptional find and we hope to write an article about them on our blog in the coming months. Thank you to everyone involved on the day and we look forward to a lovely year of beautiful weddings at Gate Street Barn. Kalm Kitchen: www.kalmkitchen.co.uk – Wonderful caterers, husband and wife team – see an article about them by clicking here. Chess Disco: www.chessdisco.co.uk – Chris Haslam is a great guy and really knows how to get the dance floor moving. Cars: www.carsforalloccasions.org – Nick and Claire Stow – Beautiful cars, tenderly cared for and great personal reliable service. Cupcakes: www.cranleighcupcakes.com – Exquisitely bespoke designed cakes. Hats: www.raeoakleyhats.co.uk – Stunning hand made hats. Magician: www.simonalexander.net – Amazing Magician who wowed us with some great illusions at the Open Day. Chauffeur Cars: www.talismancars.co.uk– Modern Cars and reliable service. David Cooper. Wine Merchants: www.tauruswines.co.uk – Specialists in providing Wines and Champagnes for Celebrations and Parties.